First of all, some breeds are hardier than others, and can better adapt to cold climates. 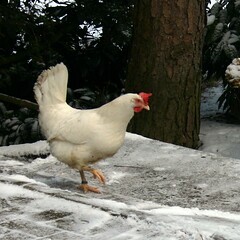 Scots Dumpy, Orpington, and Wyandottes are just a few examples of breeds that will tolerate lower temperatures. If you have not purchased any birds yet, make sure you take some time to research breeds that will do well in your climate. However, even the hardiest breeds may experience problems with frostbite on their combs and wattles. Coat these with Vaseline, which will protect their skin and keep it from freezing when the temperatures dip down. Second, think about adding insulation to your coop. There are a number of materials you can use for this. For example, I recently talked to someone that used foam board. Although I have only used "traditional" insulation, I think foam core is an interesting idea, and I just might have to give it a try one of these days. When insulating, make sure you do not cover up any of your ventilation holes. Your birds will still need their fresh air. If you want your chickens to continue laying eggs in the wintertime, you may want to install a couple of lightbulbs in their coop. Egg laying slows down considerably during the wintertime due to the lack of sunlight. You can trick your hens into thinking the days are longer by using electrical lights. As winter gets closer add more litter to roosting area of your coop. The composting of litter and manure that occurs naturally will give off some heat. You won’t have to worry too much about the smell as much in the winter but be sure when spring comes to get back on a regular cleaning cycle.